Apex Legends got its biggest update today, which added Season 1: Wild Frontier, the game’s first Battle Pass, and the first brand new character released since the game launched – Octane, the “high-speed daredevil”. With the addition of Season 1, Apex Legends also received a huge amount of bug fixes and quality-of-life improvements, including some major changes the community had been begging for. We’ve got the full patch notes below. The major addition, of course, is the newest Legend, Octane, who becomes the 9th playable character in the game. 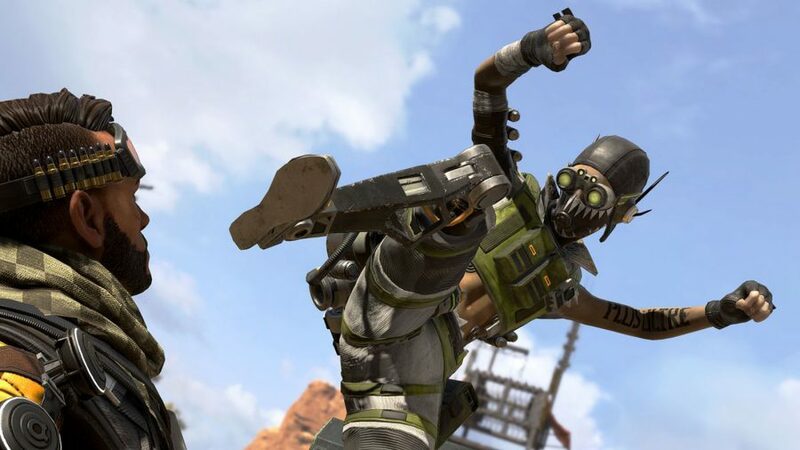 Players have suspected that the shark-masked character – whose in-game artwork leaked quite some time ago – would be the first newest hero to drop in Apex Legends, but only with these patch notes are we getting his full details. As predicted, those jump pads that popped up in the game are his Ultimate ability. More welcome, however, is the fact that at last we’re getting changes to character hitboxes. This significant issue wasn’t corrected in the first major patch for the game, but now finally the wildly inaccurate hitboxes for Gibraltar, Caustic, and Pathfinder are all being adjusted. The Season 1 patch is live right now, and the Battle Pass has also been added to the game. If players fork out 950 Apex coins for the privilege of being part of Season 1, they can earn cosmetics for their guns, badges, character skins, Apex packs, and even get back some of those coins. Other than all this, the Season 1 update contains mostly welcome bugfixes, performance improvements, and a few quality-of-life improvements. We particularly like the option to turn down screen shaking while sprinting, and Pathfinder now being able to grapple ziplines. For the rest of the changes, check out the full patch notes below. The battle pass allows players to earn over 100 items throughout the season. Everything earned over the course of the next three months is yours to keep. Everyone who players during season one can earn one Wild Frontier Legend skin, 5 Apex packs, and 18 stat trackers for the new season. New character Octane has been added to the game’s roster. Offers a 30% movement speed boost for six seconds. Costs health to use. While active, Octane is less affected by attacks that cause slowdown. 2 second recharge. Deployable jump pad that catapults players through the air. 90 second recharge. Adjusted hotboxes for Gibraltar, Caustic, and Pathfinder to better align with their shapes. Reduced tap cooldown to 25 seconds from 30. Increased radius and proximity radius of traps by around 10%. Removed a one second delay on smoke dealing damage to players. Reduced cooldown of Gas Grenade to 2 minutes from 2.5 seconds. Increased the number of Insider Knowledge beacons in the world to 12 from 10. Decreased Double-Time’s movespeed bonus to 30% from 40%. Those are the major changes heading to Apex Legends with the start of its new Wild Frontier season. With the arrival of Octane, the battle pass, and several tweaks to Legend abilities, there’s sure to be plenty to keep you entertained.